I wrote a post on Alex Feinman's ISO Recorder a few months ago, but I haven't payed much attention on the ability to create ISO images from CDs/DVDs or even hard drive folders. 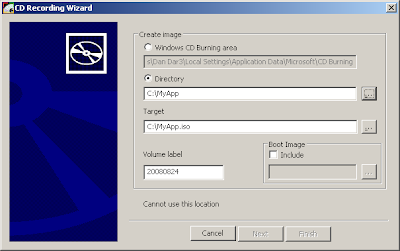 I found this now quite useful say when you want to pack your application as an .iso image and test it on a Virtual PC without having to write it on a CD/DVD medium every time you make some changes. Carefully read the release log and known issues before installing the correct version. Also you might want to give a quick glance over the ISO Recorder tutorial. 30 August 2008: If you get an error 80004005 then it's likely that you have spaces in the ISO target path / filename. Yes, or 80004005 could be a dash in the file name, believe it or not. An underscore (_) character in the volume label also kills it. Bummer, because I *must* have the underscore in the volume label for the ISO I'm trying to create.